The tropical sun burns hot on Guantanamo Bay naval base. And so does the international spotlight on how - and how long - the U.S. will continue to hold its worst-of-the-worst enemies 10 years after the September 11 attacks. Among the detainees are the alleged architects of the 9/11 attacks and the near-sinking of the USS Cole as well as scores of suspected "enemy combatants" captured on the battlefields of Iraq and Afghanistan. This September 11 will resemble every other day for the 171 men held in the detention camps, and the more than 1,100 U.S. military standing guard at Gitmo, as the base is known. It is the oldest American military installation outside the United States, 45 square miles carved out of Cuba, whose hills are visible from the fenced perimeter. On next Sunday - as they do each day - soldiers and sailors will turn to the nearest U.S. flag and stand and salute, and "The Star-Spangled Banner" will blare from loudspeakers at 8 a.m. sharp. "On 9/11 hopefully it will be a calm day like it was last year," said Col. Donnie Thomas, who has been at Guantanamo for 19 months and serves as commander of the Joint Detention Group. "Inside the camps it was relatively calm and quiet," Thomas said about possible protests. "It didn't happen last year; we don't see it happening this year." Despite the apparent calm inside the detention camps, and a marked decrease in assaults and incidents in which detainees throw urine and excrement at guards, the political debate over Guantanamo remains unabated. "It continues to be an embarrassment for the United States in the world and a recruitment tool for al Qaeda," says David Cole, a professor at the Georgetown University Law Center. Cole is a frequent critic of U.S. policies at Guantanamo and co-author of "Terrorism and the Constitution: Sacrificing Civil Liberties in the Name of National Security." "It is really about the history more than the present," Cole said. "The stain of that history stays with Guantanamo. It remains shorthand for the U.S. response to 9/11 that was essentially lawless." 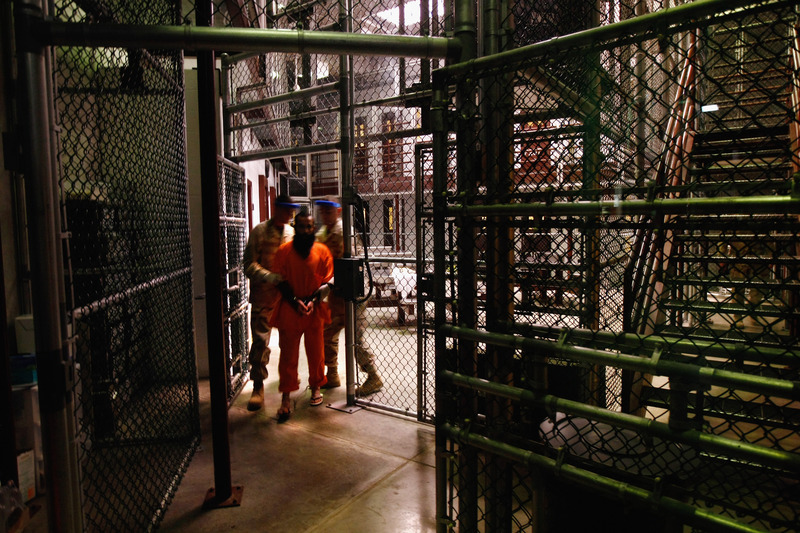 A new 107-page submission to the U.N. Human Rights Commission from the attorney representing former Australian suspect terror David Hicks gives fresh insight into early operations at Guantanamo. The document alleges that Hicks was mistreated, both after his capture in Afghanistan and later at Guantanamo. It includes allegations that Hicks was subjected to various forms of mistreatment, including beatings, sexual abuse, sleep deprivation and humiliation, and that he was threatened at gunpoint and taunted with threats of being sent to Egypt for torture. After Hicks pleaded guilty to providing material support to terrorists, he was transferred to Australia and released shortly afterward. He is trying to have the original U.S. case against him dropped, which also would allow him to collect royalties on a book he wrote about his time in American custody. Some 800 people have been detained at Guantanamo since it was hurriedly turned into a makeshift holding camp for suspected terrorists in the aftermath of 9/11. Since then - after critics lambasted the harsh conditions - procedures have been changed and the hastily assembled cells of chain-link fences have been replaced by permanent cell blocks. Hundreds of prisoners have been released - either returned to their countries of origin or settled elsewhere. The remaining 171 men are spread over seven camps. Most of them, 82%, are in communal settings where they can mingle with fellow detainees for up to 20 hours a day. Critics on the other side of the issue say that now life is too easy for the detainees. Depending on the level of camp security and their behavior, detainees have access to everything from books to soccer balls. Most get a phone call home every three months, mail, a choice of meals, as well as English and computer classes. Some even will be able to watch 9/11 ceremonies beamed from the U.S. mainland via satellite. It has been more than 2 1/2 years since President Barack Obama pledged - on his second day in the White House - to shut down the Guantanamo detention facilities within 12 months and prosecute detainees in civilian rather than military courts. Alarmed by administration plans to bring 9/11 suspects to New York for trial, Congress made it impossible to transfer terror suspects from Guantanamo to the U.S. mainland. Rep. Hank Johnson, D-Georgia, who supports closing the Gitmo camps, calls the move by Congress "a clipping of the wings of the president of the United States." "What we have here is politics limiting the president's decision to make wise decisions," Johnson said. "The Guantanamo facility remains open as a symbol of the President George Bush era of lock enemy combatants up and throw away the key without consideration of what that means." The current Guantanamo mission is spelled out and often repeated by the military - the "safe, humane, legal and transparent care and custody of detainees" as they await trial by Gitmo-based military commissions, which rely on support, including intelligence information, from the Joint Task Force. Thomas, commander of the Joint Detention Group, points to the drop in detainee assaults on guards as a sign of improved detainee conditions. "It is humane treatment," he says of the detention facilities under his command. "We should set the standard or how we treat our enemies, with dignity and respect, no matter how they would treat us." Thomas will spend September 11 with those under his command. "I'm in the compounds with my soldiers, that's where I'm going to be," he said in a telephone interview from Guantanamo. "They perform a tough, tough mission, I'm going to be with them," he repeats, searching for ways to praise them. "They are great, great individuals, ordinary soldiers doing extraordinary things." But questions about the fairness of the military trial system itself still prevail. "On the military commission, I think that is a huge question mark," said Cole, the law professor. "Can we provide justice and fair process in what remains a jerry-rigged military commission headed by judges with no experience and started from scratch?" A looming question is when the next military commission proceedings - held at two courtrooms in Guantanamo - will take place, under new procedures developed by the Obama administration. The biggest anticipation, of course, surrounds Khalid Sheikh Mohammed and four co-defendants, whom U.S. authorities consider to be the architects of the 9/11 attacks. That is expected to be preceded by a military trial later this year - no date has been set - for Abd Al Rahim Hussayn Muhammad Al Nashiri, charged with the 2000 bombing of the USS Cole and the murder of 17 U.S. sailors. Al Nashiri's attorneys argue the government should abandon the case, given that he was waterboarded - a technique that simulates drowning and is now banned by the United States - and suffered other mistreatment while in custody. That is something observers say is highly unlikely. The Al Nashiri trial could be months away, and the 9/11 suspects may not go into a Guantanamo courtroom for years. U.S. military personnel at Guantanamo, their families and other civilians have marked 9/11 in past years with speeches and events such as a recreational run. This year will be similar. Cole acknowledges the national policy of holding terror suspects at Guantanamo probably will continue way beyond the 10th anniversary of 9/11. "It is likely to be with us for a very long time," Cole said. And Johnson, the Georgia congressman, admits that he doesn't see any "groundswell of angst" that Guantanamo should be closed. "It is not a central issue," he said. There have been no new terrorism suspects brought to Gitmo since March 2008. Some three dozen detainees, including the 9/11 suspects, may eventually face a military trial. There is a whole group of detainees - some four dozen - who are considered too dangerous to be released or sent elsewhere, and there is not enough evidence to put them on trial. They will be held until a decision is made that hostilities in the terror fight have concluded. Some 30 detainees eventually may be repatriated to Yemen if the United States thinks the security situation there has stabilized. And scores more may be sent to other countries if - and that's a big if - the United States can negotiate their resettlement. And the top U.S. official who works to persuade other countries to accept Guantanamo detainees - those judged unlikely or less likely to pose future threats - also takes a measured view. "There have been enormous perception problems with Guantanamo, and Guantanamo has been the subject of heated, exaggerated and often highly polarized and inaccurate debate from both sides, from all sides," diplomat Daniel Fried told a House Armed Services subcommittee hearing this year. "Guantanamo itself, the facilities, are modern, decent, humane and the people who work there should be given credit for doing a tough job and doing it, as far as I can tell, doing it extremely well," Fried testified. "Closing it remains in the national interest. Doing so, in the best of circumstances, raises complex and difficult legal, diplomatic and security questions and choices." No mention of the scores who were released only to attack and kill Americans again? LEAVE THEM THERE UNTIL THE HOSTILITIES ARE ENDED OR EXECUTE THEM! What, are we supposed to throw them a banquet? Of course we can mistreat terrorists. They want to do a whole lot worse to us. Many of the people in there already have. Learn which "civilian" companies are making big bucks on today's wars. In 2001, the massive arms dealers Lockheed Martin, Boeing and Northrop Grumman ranked one, two and five among Department of Defense contractors, raking in $14.7 billion, $13.3 billion and $5.2 billion, respectively, in contracts. Last year, Lockheed’s contract dollars were almost double their pre-9/11 level, clocking in at $28 billion, while Boeing’s had jumped to almost $19 billion and Northrop Grumman, still in the five spot, had more than doubled its 2001 take, with $12.8 billion in contracts. America’s recent wars have obviously been good to these companies. On September 10, 2001, Lockheed’s share price was $38.32. Today, it tops $70 per share. In 2001, the company’s net sales reached $24 billion. Last year, they were almost $46 billion. Likewise, Northrop Grumman’s net income has more than quadrupled in the last decade, according to the investment analysis website, Seeking Alpha. Still, these corporations are just a fraction of the story when it comes to the massive sums of money made by the military contractors since September 11, 2001. 2. FedEx: The overnight shipping giant is a long-time defense-contracting powerhouse that has also seen an exponential increase in contract dollars since September 10, 2001, when its stock was trading at just under $40 per share. By the end of that year, FedEx had been awarded about $211 million in contracts from the Pentagon. In 2010, the company received $1.4 billion from the Department of Defense and this year, with its stock closing in on $80 per share, has already passed the $1 billion mark, again. This includes a $182 million deal, inked in August, to pack and ship fresh fruit and vegetables to U.S. military bases overseas and a joint agreement, which also includes United Parcel Service (UPS) and Polar Air Cargo, which could last up to five years and potentially net the companies a combined $853 million. 3. Dell: If you’re in the military and you want to pilot a drone, transfer supplies or write a memo, you need a computer. That’s just what Dell provides. The desktop- and laptop-maker has been plying the Pentagon with computers for many years and, just like Lockheed, Boeing and Northrop Grumman, has done especially well by the Department of Defense since 2001. That year, Dell was awarded $65 million in Pentagon contracts. By 2009, that number had jumped to $731 million and, over the course of the decade, has added up to a total of $4.3 billion in contracts for the PC manufacturer. 4. Kraft – From A-1 steak sauce, their signature mayonnaise and Oreo cookies to Oscar Meyer hot dogs, Planters peanuts and Wheat Thins crackers, this company ranks as one of the largest and best known food concerns in the world. Not surprisingly, it also does a brisk business with the Pentagon which has grown ever larger during the last decade. Back in 2001, Kraft inked $148 million in deals with the Department of Defense, by 2010, its yearly take had risen to $373 million. Other big-name firms that are regularly awarded large, lucrative deals from the Defense Department include tire titans Goodrich and Goodyear, oil giants Shell and Exxon Mobil, big food suppliers like Nestle, General Mills, Tyson, ConAgra and Campbell's Soup, and tech and telecom stalwarts including AT&T, Oracle, Sony and Verizon. A decade of waging wars abroad, from Iraq and Afghanistan to Pakistan and Libya to Yemen and Somalia hasn’t been kind to average Americans. As the United States poured nearly $8 trillion into national security spending, and the national debt ballooned from $6 trillion to $14.3 trillion, the official unemployment rate has more than doubled - from 4.5% to 9.1%. Meanwhile the number of children living in poverty in the U.S. has jumped nearly 20% since 2000, according to the National Center for Children in Poverty. And for older Americans, the risk of hunger has spiked almost 80% since 2001, according to a recent report by AARP. But from car companies to candy makers and even the biggest brands in organic food, so many of the world’s favorite companies have, over these years, cashed in on America’s wars. In his famous 1961 farewell address, President Dwight Eisenhower warned of the "acquisition of unwarranted influence" by what he called the "military-industrial complex.” Today, however, the "large arms industry" that Eisenhower warned about is only part of the equation. Civilian firms such as FedEx and PepsiCo form the backbone of what more accurately can be described as a military-corporate complex of “civilian” businesses that enable the Pentagon to function, to make war and to carry out foreign occupations. Almost a decade after Eisenhower's farewell address, there were still only about 22,000 prime contractors doing business with the Department of Defense. Last year, according to U.S. government records, the number stood at almost 135,000. The reasons why are simple. Big war budgets and ever-increasing national security spending have made the Pentagon’s deep, taxpayer-filled pockets especially attractive as a stable source of income in economically uncertain times. Most Americans will never buy anything directly from Lockheed Martin, Boeing or Northrop Grumman, but many have spent money on Crest toothpaste (Procter & Gamble), Cheerios (General Mills), a PlayStation 3 (Sony) or paid for cell phone service from AT&T or Verizon – all of them big-time defense contractors. These and other large corporations have done very well, reaping rewards not only from Americans at the checkout counter but from their tax dollars by way of the Pentagon. Meanwhile, halfway across the planet, large numbers of Afghans and Iraqis - who have seen their lives upended, their homes destroyed, and their family members killed and wounded - have suffered as a direct result of the efforts of these and other members of the military-corporate complex. Even with the specter of only modest growth (or even cuts) in defense spending on the horizon, the number of companies seeking the stability of a Pentagon paycheck is likely only to rise. And with it, the U.S. civilian economy is sure to become further militarized by stealth corporations cashing in on a state of permanent war, while the American public remains largely oblivious to their role in the military-corporate complex and America’s war-making overseas.